Collecting cookbooks interests me a lot! after collecting so many book's, i felt that only few book's are worth saving for life-time. now a days i restricted myself in buying cookbook's. only if i desperately long for a book, i buy it. Cooking at home with Pedatha was one book, that i wanted to buy for a long time, when hubby gifted me the book for my last year's birthday, i was so excited about the gift! maybe the warmness and love filled recipes in the book or my favorite andhra recipes should have been the reason for excitement! 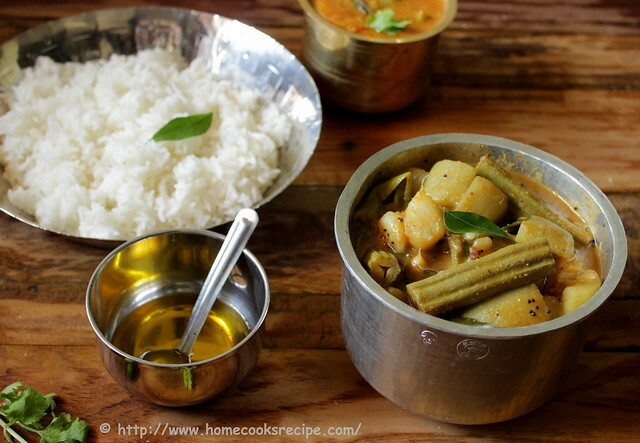 Today's recipe is from Cooking at Home with Pedatha! do try, you will love this curry as it will have balanced taste of sweetness of jaggery, tangy from tamarind and spicy from lots of chillies! I almost cook just an hour before the lunchtime. mostly i don't plan my meals, i go and check my refrigerator and decide on that. some times i call and ask my hubby on what to cook, he always leaves to my choice!! 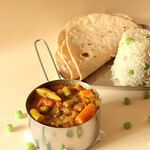 I wanted to try this curry for a long time, luckily had vegetables in hand and went ahead! Do you plan your meals the previous night? Heat a pan, and dry roast the split urad dal, bengal gram and sesame, till they reach golden color let them cool and grind into a fine powder. Boil 1/4 cup of water and remove from flame and add tamarind to it and let it soak for 10 minutes and squeeze the pulp. Wash the bottle gourd and peel it's outer skin and chop into big chunks. do the same to sweet potatoes. chop the other vegetables into big chunks. 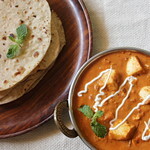 In a pan, heat oil, add mustard and let it splutter, add fenugreek seeds, asafoetida powder, green chillies and curry leaves. Then add all the vegetables together and mix well with the tempering. add enough water to cover the vegetables and let it boil for almost 10 minutes, till all the vegetables are cooked well. 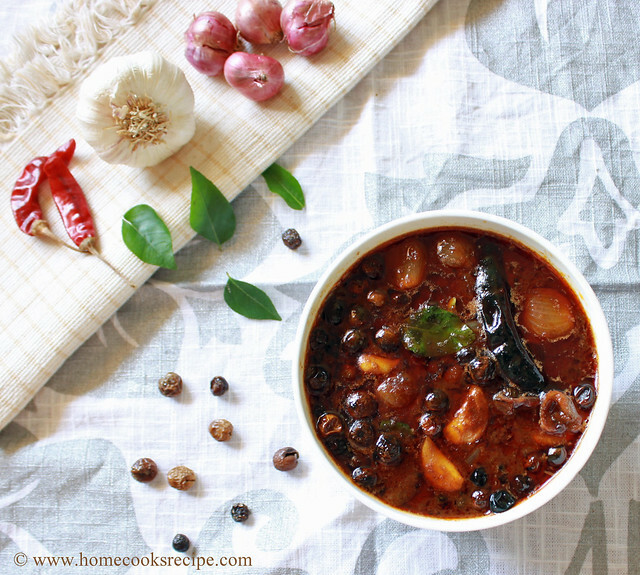 Meanwhile, To the squeezed tamarind water, add 1 cup of water then the grounded powder, sambhar powder and mix well. also mix in the jaggery ,mix with your hands. this way, you can mash the jaggery and also mix well. Now, after the veggies are cooked, add in the tamarind water and mix well with the vegetables. Let the curry boil for 5 minutes in medium flame..
Garnish with corriander leaves and curry leaves. 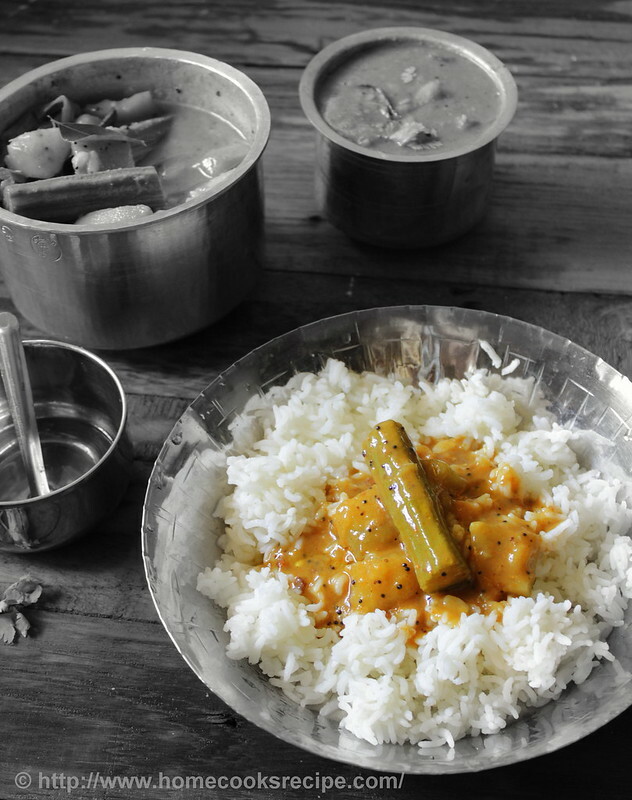 Serve warm with rice and ghee! I am addicted to cooking and baking books, in the begning when i started buying decades ago i used to buy just like that so i have so much books which i hardly use, but now for the last years i just buy the book i think which is relaly intresting and usefully and which i know i will use them often. Wish i had that veggie curry and rice looks delish. 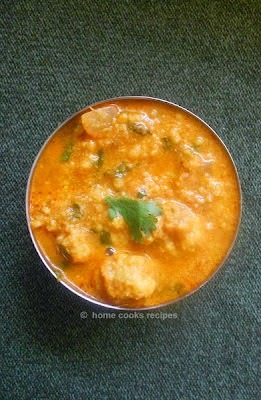 Love to enjoy this sweet and spicy vegetable curry with some rice and papads, will make some soon. Awwww.. looks absolutely tempting and inviting. lovely presentation too.. this is my fav pulusu.. AWESOME!!!!! Looks so delicious, nice clicks. 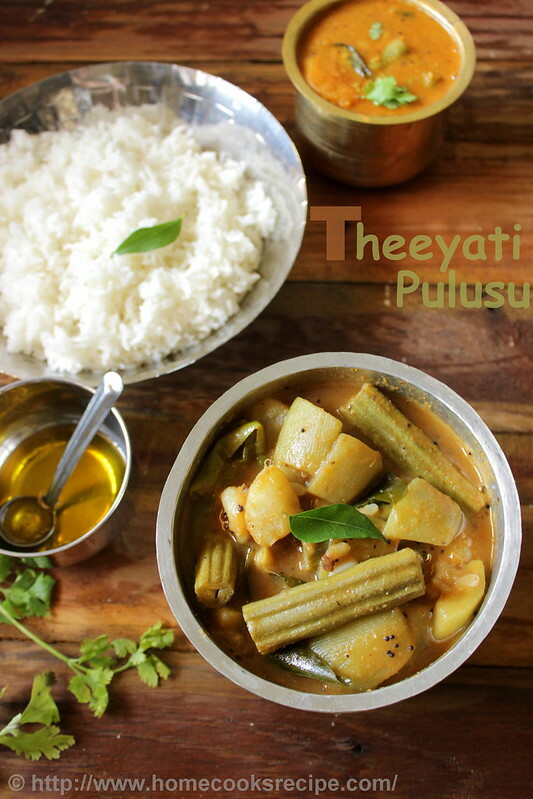 I like Cooking with Pedatha too, not only for its recipes and beautiful pics, but also for the really nice way in which it is written. The pulusu looks tangy and wonderful.